The first teaser for Jurassic World: Fallen Kingdom just hit computer screens on Sunday, but now plans for an augmented reality book for the film have also emerged. Based on a listing for the official augmented reality book on Amazon, the 32-page book by author Caroline Rowlands has the same name as the film and will be available on May 3, 2018. 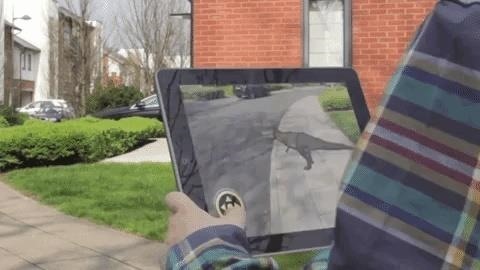 Carlton's official augmented reality book is jam-packed with exclusive movie imagery and background facts, and lets you experience original Jurassic World dinosaurs through mind-blowing next-generation, fully interactive Digital Magic. Learn how to bond with and train alpha Velociraptor 'Blue,' then use her as your protector and guide as you encounter other dinosaurs through the app. From brand new movie dinosaur characters including awesome Baryonyx and a terrifying new hybrid breed, to old favorites like T. Rex and Stegosaurus, this Jurassic World AR book will wow readers all over again. As fan site Jurassic Outpost reports, the book description teases the first film appearance of fan favorite Baryonyx, a 30-foot-long bipedal carnivore. The book joins the Digital Magic series from Carlton Books, the publisher that previously published a pair of AR books for Jurassic World, the first film in the reboot of the Jurassic Park trilogy. So far, the publisher has printed two dozen AR books, including the recently-released tie-ins to the Alien film series. Books in the Digital Magic series require a dedicated mobile app for iOS or Android to activate the augmented reality content embedded within the book's pages. The previous Jurassic World books, Jurassic World: Where Dinosaurs Come to Life and Jurassic World Special Edition: From DNA to Indominus Rex!, gave readers the ability to project dinosaurs into their physical environment, move them around, and expand them to life-sized proportions. 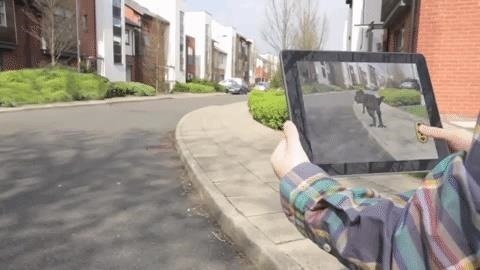 Now that AR is a native part of the iOS and Android mobile platforms, the technology is well on its way to becoming the default technology to promote movies, and it could also end up muscling in on the coveted "officially licensed" product market as well.